We no longer recommend adding keywords to the title or adding any extraneous keywords to the description. You will get your Places account rejected if you do this as Google is really cracking down. On another note, Google Boost has launched which offers a paid extension of the benefits below. Check it out on our post What is Google Boost? I’m going to get you on the first page of Google and I’m not going to charge your for it. No, this isn’t some scam, it’s in use every day in every city around the world. 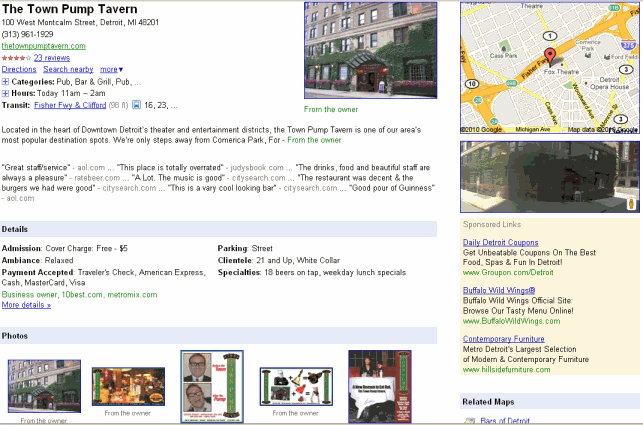 Check out this screen shot of a search completed in Detroit Michigan for “Detroit bar”. Notice the part I highlighted in green? This is Google local search results. For most small businesses getting more local search results will make a huge impact. How then, with millions of websites and people searching from all over the globe, do you stand out in your city or metro region? Google makes it easy with Google Local Business Center. More people search locally on Google than anywhere else. Show them coupons, add videos and photos, and even post real-time updates. Your business name is an important part of getting people to click on your listing and also getting ranked for certain keywords. You don’t want to stuff your name full of keywords but giving a secondary title to your company can help. An example from the search above is to take “The Town Pump Tavern”. Instead of their current name, they could modify it to get better results by using “Town Pump Tavern – Detroit Bar”. Not only does this help with keywords but it also helps searchers to quickly identify it as a Detroit bar. Note: For your business name, you may see negative effects of adding in a geographic location if you’re not in that geographic location. If I try adding in “Detroit” to a company when I live in New York, I probably won’t be listed in the Detroit search results. You must enter your physical address. The address is important in letting Google know where to serve your company information up on local search results. Use a general email address that can be listed publicly. Don’t use a personal email address. Use your main website that you want customers going to. This is where you sell your company and is a good place to put keywords. Your goal here is not to create a list of keywords. You need to create a captivating sales text that will make people want to visit your establishment while adding in keywords. You only have 200 characters so give it some impact with the main points you want visitors to get. Take the fluff out and get to the point. These are the most important part of Search Engine Optimization (SEO) for your Local Business Directory listing. You must select at least one Google suggested category then you can enter in up to 4 more by taking one of the suggestions or adding in a custom category. I suggest trying to find a suggested category but not accepting something that just doesn’t quite fit. Make sure you maximize the categories by adding all five. This is where you want your main keywords that will drive traffic to your listing. “Bar & Grill” was selected for a category for the Town Pump Tavern, which is an excellent category. 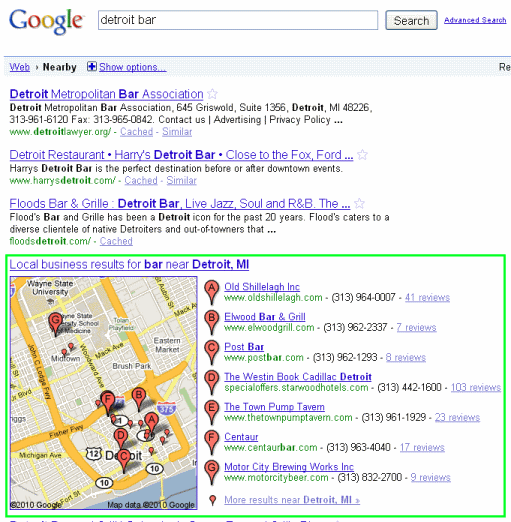 Google showed a search volume of 33,000 for February 2010 on “Detroit Bar”, which far outweighs all of the other bar related search terms in Detroit. Having “Bar & Grill” as one of the categories and being located in Detroit gets this bar shown in local listings for the search term “Detroit bar”. Note: Do not add geographic terms like “Detroit” into your categories. Google has caught onto this trick and won’t list your listing as high as it would be without the geographic term. Make sure you fill out everything in the listing as Google will mark it 100% and give preferential listing to companies that have complete listings. Part of that is adding photos. Add photos that sell your establishment. Google is picky on the dimensions so if you upload a photo and you don’t automatically see the preview, it’s because it’s not the correct dimension. The thumbnails are listed at 60px tall by 90px wide (think HD) so you can upload anything that adheres to those dimensions. Most of my pictures ended up being 300px tall by 450px wide. Also, although it’s a pain, Google doesn’t allow you to reorder your images. To reorder your images you need to delete them all and re-upload them. Details provide extra information to your customers like “Parking: Available” or Payment Accepted. Payments are selected by checking what you accept. Other details are added with free-form text. Also, if you notice the green text in the Town Pump Tavern listing at the bottom of the details section, Google Local Business Center also pull in information from other sites or trusted information sites for your details section. In this example, information was pulled in from 10best.com, metromix.com, and added by the business owner. Visitors to your listing are able to leave a review for you much like any review service. Additionally reviews from other sites and blogs that mention your business are pulled in and listed by Google. While you can’t moderate comments, you can mitigate your risk from bad comments by first of all having a good business 😉 but second by going to the review section. In the review section any user can click thumbs up or thumbs down for any review on whether it’s helpful. Also for truly belligerent reviews, they can be flagged. Good reviews and excited customers will always over power a couple of bad reviews. Before your listing goes live Google needs to verify it. They do this one of two ways. By calling the phone number you provided and giving you a PIN number (instantaneous) or by sending you a postcard with the PIN to the listed address which takes a couple of weeks. You then enter the PIN in for confirmation and Google gets you up and running in search results within 30 days, although I’ve found it to be a couple of weeks. Well, that’s it. I’ve shown you how to get on the first page of Google for free using Google Local Business Center. Besides a little time spent on creating your listing and a little keyword research, there’s no investment on your side. When creating your listing, think about it from your customers perspective of what they would be searching for and what they would want to see. Don’t fall into the trap of just trying to optimize your listing for keywords by stuffing them everywhere. Google and your customers will see through it. So… how much traffic does Google Places really drive to a aite? It depends on the type of site you have. If you have a restaurant, bar or other retail type of place, you can get hundreds of visitors a month from Google Places. I have a client that does events that receives 75-125 visitors a month from the their Google Places account. They also have people using their account to find directions to their place of business. Having your business listed above the other search results for relevant local traffic is huge if you work a lot with local clients.